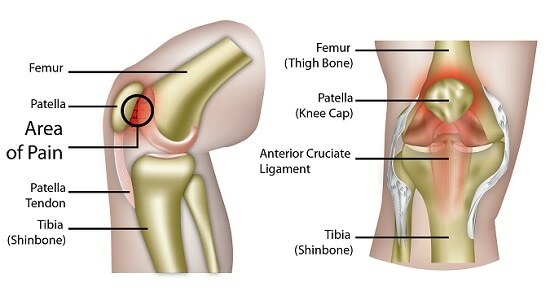 Patellofemoral pain syndrome (PFPS) is described as pain behind the kneecap (the patella) and around its peripheral due to various biomechanical and anatomical abnormalities. Pain usually worsens with activity, especially when ascending or descending steps or a hill and running, and is also aggravated by prolonged periods of sitting with the knees bent. One or both knees may be affected. It’s caused by an imbalance of forces that act on the kneecap as it slides over the lower part of the thighbone (referred to medically as the femur). It typically affects physically active individuals between 15 and 30 years of age. The prevalence is 21-45% in adolescents and 15-33% in adults, with women being affected more than two-folds compared to men. PFPS accounts for 10% of injuries seen in physically active individuals during clinic visits and is the most commonly diagnosed injury in runners, with a prevalence of 16-25% of all running-related injuries. The cause of PFPS (patellofemoral pain syndrome) seems to be multifactorial; there are, however, theories that specifically point to biomechanical dysfunction, muscular dysfunction and overuse as factors that contribute to PFPS. Popular theories on biomechanical factors that are potential causes of PFPS include flat feet and feet with high arches. Those with flat feet (or “pes planus”) have no support in the midfoot where the arch should be, hence the term flat feet, which leads to an inward rotation of the thighbone or shinbone. This disrupts how the kneecap moves, and causes an imbalance in the forces acting on it. Feet with high arches (or “pes cavus”) have less cushioning compared to those with normal feet, and this places pressure on the patellofemoral joint consisting of the kneecap and the lower end of the thighbone. For muscular dysfunction, weak quadriceps has been noted as the area of greatest concern. Weak or tight hip muscles, tight hamstrings and tight calf muscles can also apply excessive force of the kneecap or affect the way it moves along the thighbone lower extremity. PFPS as an overuse injury occurs with repetitive weight bearing situations such as running, walking up and down an incline and uneven surfaces. Forces that act on the kneecap can range from 30-20% of the total body weight when walking, to up to 7 times the body weight during squatting. All these activities involve knee bending, which increases the contact the kneecap has with the thighbone and hence pressure applied to both bones. This is why for someone with PFPS, sitting for prolonged periods can also aggravate the pain. A “popping” or “catching” sensation may be described as well as swelling and “locking” of the joint, where it cannot bend or straighten. Although these are not always typical symptoms of PFPS (patellofemoral pain syndrome), so other possibilities such as meniscal tears should be investigated. Changes in physical activities may also be an indication of PFPS due to overuse. Often times, PFPS is diagnosed based on exclusion of other possibilities for anterior knee pain. A physical examination and careful assessment of patient history is usually sufficient to diagnose PFPS (patellofemoral pain syndrome). Single-leg squats can allow the examiner to see if the movement of the kneecap is abnormal. Having the patient sit with knees bent, and then extending them can also be used for this purpose. With the patient lying down, legs straight, the clinician can palpate around the area to more accurately determine the location of the pain, quadriceps muscle tone at rest and when contracted, and if there is any joint effusion (or excess fluid). Joint effusion is uncommon in PFPS and suggests that the underlying problem is something else. Range of motion in the hip and the knees should be assessed as well. If there is pain from movement of the hips, it may indicate a hip joint abnormality instead. The knee retains its range of motion for patients with PFPS, so if there is pain with a grating, crackling or popping sound, other possibilities should be explored, for example osteoarthritis. Special tests such as the patella glide, patella tilt and patella grind tests should also be performed and tightness of muscles such as the quadriceps assessed. For many patients, imaging is not necessary and treatment can commence without it. In persons with a case of trauma, surgery or persons over 50 years old, however, radiography imaging is recommended. CT and MRI imaging is not necessary but the latter can be used to identify other injuries or underlying conditions such as stress fractures in the kneecap. Treatment should first focus on reducing forces acting on the area that may have caused the condition. Resistance exercises including squats and lunges should cease until after recovery. Runners should reduce their activities to a level that doesn’t cause pain. Alternative exercises such as swimming and cycling can be considered. The use of ice packs may help alleviate pain after physical activities. If ice application does not work, non-steroidal anti-inflammatory drugs (NSAIDs) and acetaminophen can be prescribed. Physical therapy aimed at correction kneecap movement has been found to be effective at treating PFPS (patellofemoral pain syndrome). Surgery may be considered for patients that do not improve after going through 6 months to 12 months of a rehabilitation program. Rodriguez-Merchan, E. C. (2014) Evidence Based Conservative Management of Patello-femoral Syndrome, Arch Bone Jt Surg 2, 4-6. Juhn, M. S. (1999) Patellofemoral pain syndrome: a review and guidelines for treatment, Am Fam Physician 60, 2012-2022. Clijsen, R., Fuchs, J., and Taeymans, J. (2014) Effectiveness of exercise therapy in treatment of patients with patellofemoral pain syndrome: systematic review and meta-analysis, Phys Ther 94, 1697-1708. Waryasz, G. R., and McDermott, A. Y. (2008) Patellofemoral pain syndrome (PFPS): a systematic review of anatomy and potential risk factors, Dyn Med 7, 9. Dixit, S., DiFiori, J. P., Burton, M., and Mines, B. (2007) Management of patellofemoral pain syndrome, Am Fam Physician 75, 194-202.